Racing Day 1 Padller Update from Prague! Hey there Tampa...it&apos;s Phil bringing you the paddler news from Prague for the World Dragon Boat Racing Championship. It’s late evening now and we’re back from our first day of racing. This was an unbelievable day of Dragon boating. First we arrived, located our tent and found places for all our gear. We then headed up to the grandstand area to participate in and view the opening ceremonies. They were great. Each country selected four or five team members to march out carrying the country’s flag eventually all lining up in alphabetical order by country name. Everyone was decked out in their country colors. It was a colorful and very cool event and experience. After a short program the games were officially pronounced “open”. At that, off we went back to our tent to prepare for the 2000 meter races. It’s late and unfortunately I can’t describe all of the day’s events. But let me say I experienced the best day of dragon boating that I ever have. The 2000 meter race required each boat to take off sequentially behind the previous boat in 12 second intervals, then make two large loops of about 500 meters each. Object: do it in the fastest time. This is more difficult than it seems. First, you want to catch and pass the boats in front of you and the ones behind you want to catch and pass you. There are lots of rules about how and when to pass. . . but my job, thank heaven, was to paddle. Don’t think, just paddle and paddle hard. In my race there was a lot of drama today. First there was some jockeying regarding our starting position. Then, as the race got going we began to take on water. It’s not good to take on water into the boat. Actually, several boats during the day swamped. It actually happened to our Grand Master men’s boat. . . so unfortunately they didn’t get to finish. Somewhere along the race route I recall we passed a boat or two, but I’m not really sure. All I know is that we kept taking on water. More and more water. Going straight and around the turns. 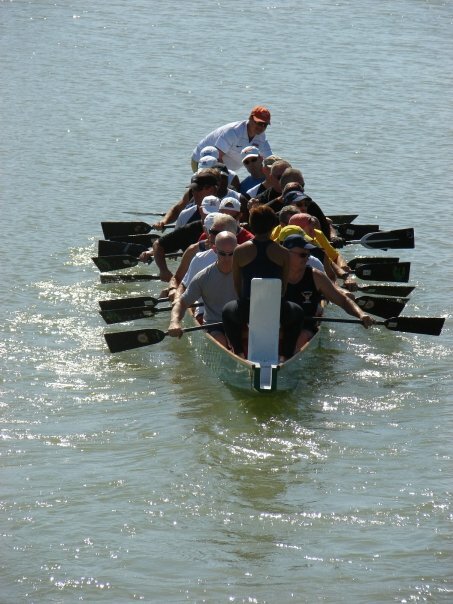 Somewhere, late in the race our steersperson almost fell off the back as the steering oar went too deep drove him toward the side. Somehow our tenth row paddler, Chip, reached around and caught him. By the time we got to 1,500 meters there was water in the boat almost up to our seats. We probably had less than ½ inch of free board. There was a lot of yelling by our drummer to keep paddling. That was interspersed with our steersman yelling. . . “we’re going under… PADDLE! Bring it up! Someone yelled to start bailing, but then yelled there wasn’t anything to bail with! So, more yelling to paddle. So, guess what? We did. I can tell you it’s the hardest and longest I’ve ever paddled. We crossed the finish line in just over 9 minutes and virtually no free board. We headed as quickly and carefully as possible straight to the dock. It was incredible fun. I just knew there was no way we could have come close to any medal pulling that amount of water. But guess what again? We did. We pull off a third place finish!!! I now had competed in my first world class competition and medalled!!! I will never forget that race. It was worth the entire trip! At the end of the day, we took home one gold, (the premier men won their event), two silvers by the women, and one beautiful bronze. Today I like bronze better than gold…but tomorrow is another day. I’m sorry I don’t have more time for more details of the day because there are countless ones, but since I have to be up and on the bus at 7:00am I’m going to bed and you’ll just have to wait until tomorrow just like I do! More tomorrow...go Team USA! And go Tampa Bay!